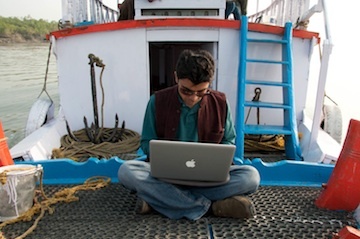 I am sitting in the prow of a small launch in the Sundarbans. It is 2.30pm and we have just about ten minutes ago turned into a wide river – which I think is the Jhilla – from the Burirdabri Khal. The waters are falling. 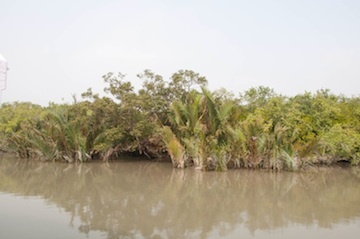 The tide is receding revealing more and more of the land they submerge, more and more of the contours of the narrow creeks they flood, more and more of the network of mangrove roots that hold up the trees in a tangled and interconnected mesh of precarious support. The waters are calmer now, with gentle ripples – the strongest being the waves our launch kicks back as it glides sedately forward. The surface reflects floating impressions of what lines the banks – a myriad shades of green and brown that will defy the colour palette of the most inventive painter. 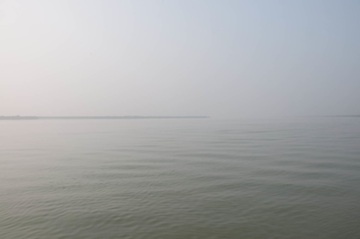 And as one moves away from the bank in this vast expanse of water that is only one of the many rivers that we have experienced since yesterday, it reflects the blue-grey milkiness of the sky – a depth below reflecting a depth above. To my left the sun has begun its journey into the earth, and the waters there shine silver as they catch the light, play with it, throw it up momently in little celebratory crests of gold and subside once again, seemingly at peace. Yes, the tide is receding, but as the sun warms my left shoulder I remember this morning when it was engaged in conflict with the thick fog that swirled up from the rising waters, only managing to imbue the mists with a greyness of intangibility. The air was damp, the stiff breeze had a chilly bite to it, and the sun only appeared as a suffocated pale disc, looking more like the moon than its powerful self. But in moments when the fog let down its guard and a bundle of rays managed to get through, the waters shone like burnished gold, delighted in the promise of a warmth to come. It was all magical then, it is all magical now. As I sit here enveloped in this world all around me – the river stretching out before my eyes, a dense green bank to my right, a long, low shadow of a bank far to my left broken unevenly by the silhouettes of treetops, and the blue cloudless sky above turning into a blinding white where the sun is – I feel alone, but not lonely. I feel a oneness. I feel I belong, I feel an acceptance by this place which moves and humbles me. And more than anything I feel my smallness, but do not feel slighted by that. I feel the generosity of this landscape but can only imagine its power. I feel grateful, I feel Grace, I feel peace, I feel Majesty. I feel everyone I love and have loved and lost around me, I feel them with and within me in this place, space and moment. Amazingly, I do not feel their absence. It’s as if this – where I am and what is being given to me with quiet, sombre dignity – is a burden too beautiful and precious for me to bear on my own. They are in this landscape, in this suspended moment that extends into eternity – helping me experience it, helping me articulate it, helping me remember it, and remember them. I am in the midst of a gift truly offered, truly given – a pureness that knows no motive other than making the planet I call my home a more beautiful, a more awe-inspiring place. People look and pray for miracles all the time. Here is one, and we don’t see it.